Diaphragm Pumps are one type of pump that is not centrifugal in configuration. These positive displacement pumps are low volume pumps that are not limited to clear water: they can pump mud, trash and more. 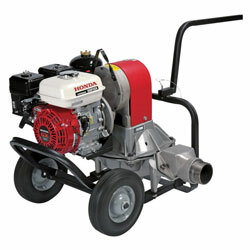 Honda Diaphragm Pumps are capable of running dry and pumping water with greater than 25% solids by volume. Perfect for slow seepage situations. You can count on Honda to keep the site dry.